Infuse your wedding with Toast’s signature je ne sais quois in every detail, so that the entire day is customized to you in a way that can never be duplicated. Our award-winning Ottawa wedding planners believe in slowing down the planning process to allow the art of simplicity and exclusivity to coincide. By working with a limited number of clients per year, we guarantee elevated design concepts, detailed consultations and unrivaled creativity. We’re your personal guides for every step of the design journey, focused upon investing in the best of what you love for an inspired and meaningful celebration. Introductions to in-demand vendors and direct access to Toast’s revolutionary ‘Online Dashboard Planner’ are but a few of the luxurious extras our clients enjoy. Every modern wedding is designed with mindful minimalism at its core, masterfully curated to make an emotional impact. Planning a fabulous event takes a lot of work. You know exactly what I’m talking about as you’re in the midst of throwing probably the biggest party of your life. It’s all in the details. The most memorable celebrations are, hands down, always the most personalized ones. I live, eat and breath weddings. I’m not going to give you checklists or corny sentiments that have nothing to do with who you are and how you live. What you need from me is to share the kind of information that just isn’t out there. The industry is full of unattainable ideas or, even worse, one-size-fits-all planning techniques. So getting back to my words of wisdom, now is one of those times to relax and enjoy the roller coaster ride ahead of you! great vendors, why do I need a planner?”. Picking vendors is just not the same as planning your wedding. It’s like cooking; having spectacular ingredients doesn’t mean you’re going to have a great meal. It’s the talented Chef that brings it all together. Extraordinary weddings have vision behind them. That’s where a planner comes in to pull all elements together, and the key ingredient is knowing how to masterfully orchestrate it. With over a decade of weddings under our belt we've compiled a list of our most frequently asked questions about our client process. If your searching for answers, we promise you'll find them here. Meet the team that has garnered a reputation for designing not only gorgeous weddings but a client experience like no other. 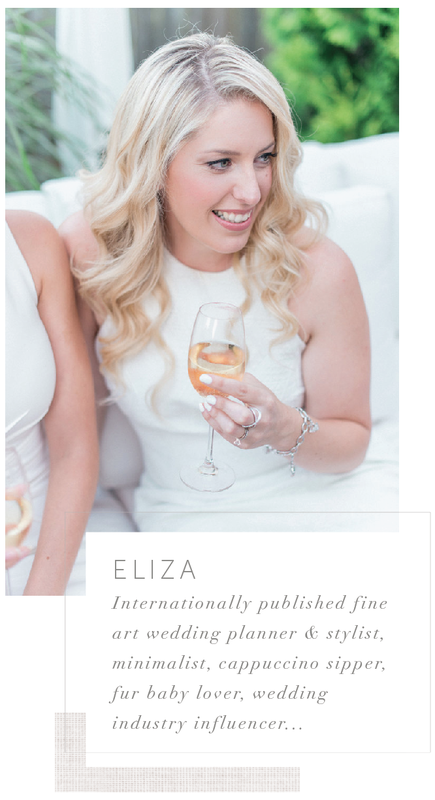 For almost a decade Eliza and her planners have refined their client planning process in 6 easy steps, paired with their exclusive online planning platform. Each planning tool has been customized with the toast bride in mind. Whether your a Full Plan bride or are simply looking for Day Of Coordination, each and every client is invited to enjoy these perks. The process she's curated overtime has garnered the attention of numerous publications such as Elle Magazine, Wedluxe, Style Me Pretty, Grey Likes Weddings, Ruffled, Huffington Post and Canadian Living to name a few. Design is always at the forefront of how Toast plans their weddings. A concept must first be established before pairing the perfect vendors & creatives in order to bring our clients elevated design concepts full circle. Our detailed consultations provide you with access to exclusive industry insights from Toast experts to empower your wedding journey. Come away from this in-depth meeting with a guaranteed wealth of practical and inspirational information, including budget management, unique creative concepts, personal vendor recommendations, and a great deal more designed for you. Everything you need to know about throwing a wedding beyond your dreams, without stress or anxiety, is waiting for you in our vibrant Byward Market office.